PHOTO BY JACOB GURNEY Personnel work at the scene of a house fire at 1833 S. CR 19 Sunday evening. Crews responded to a house fire at 1833 S. CR 19 Sunday evening. Chief Fred Bishop of Clinton Township Volunteer Fire Department said a Bascom Joint Fire District volunteer firefighter, Dave Hohman, lives in the house. Nobody was home at the time of the fire and nobody was injured, he said. When crews arrived, there was a small fire at the back of the house and crews used an interior attack to fight it, Bishop said. It took about half an hour to put the fire out and personnel remained at the scene for about two hours making sure it was completely out and completing their investigation, he said. The occupants were displaced and were staying with family, Bishop said. CR 19 was blocked from US 224 to Gibson Street and traffic was detoured around while crews worked at the scene. 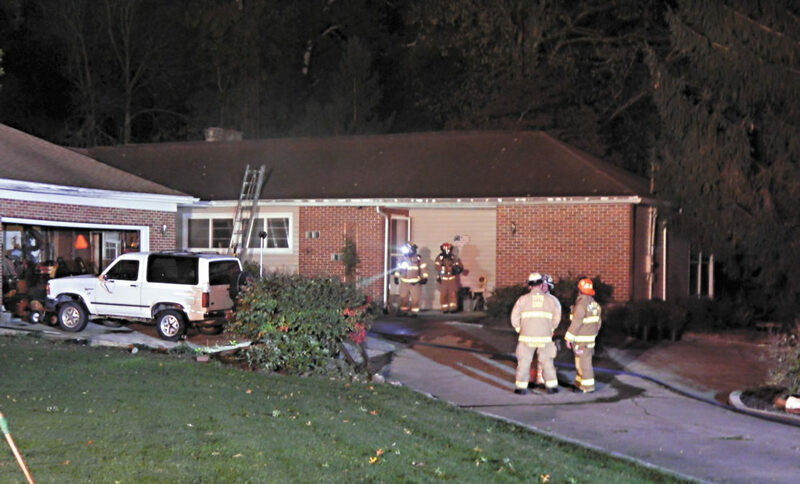 The fire was reported at 7:03 p.m. and Clinton Township Volunteer Fire Department, Tiffin Fire Rescue Division, Bascom Joint Fire District, Seneca County Sheriff’s Office and Tiffin Police Department responded to the scene.